What are you all up to this weekend? I am going to try to catch up on some museum exhibitions, since I am woefully behind on seeing all the coolest things that the incredible New York arts scene has to offer. Here are some of the top exhibitions on my 'to see' list. Have you seen any of them? What did you think? 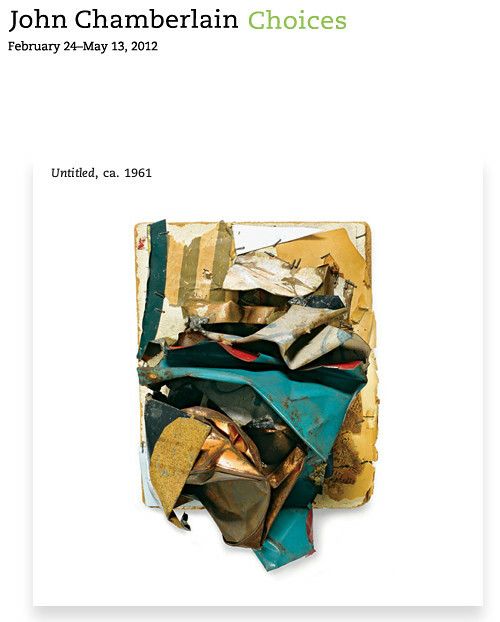 A look into the full career of the most famous Abstract Expressionist sculptor, John Chamberlain: Choices traces the artist's output from the early monochromatic metal work to his iconic car-based constructions. It should be absolutely beautiful in the Guggenheim's gorgeous Frank Lloyd Wright spiral building. On view at the Guggenheim until May 13. From what I have read, the long-awaited Cindy Sherman retrospective at the Museum of Modern Art promises all the drama and excitement one has come to expect from an artist who has spent her career adopting countless different personae and a museum that has delivered one blockbuster after another for the last several years. On view until June 11. A look into the extensive and impressive collection of Gertrude Stein and her family, The Steins Collect features work by all the modern French masters like Degas, Manet, Renoir and many more. On view at the Metropolitan Museum until June 3. The New Museum always seems to have a knack for bringing to light young, interesting artists. The Ungovernables, the latest installment of the museum's triennial, has apparently continued this tradition by focusing on how a new generation of artists has rejected incorporation and embraced self-awareness and individuality. Sounds suspiciously similar to an artistic version of the Occupy movement and the 99% percent, but I am intrigued. On view until April 22. Also, don't forget to enter the Baggu giveaway! It's only open until Tuesday morning, so head over here to have a chance to win!